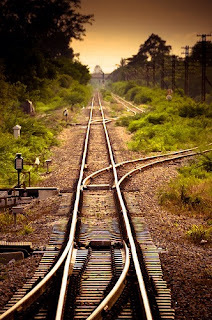 For me, the first trimester feels rather like being on a runaway train (or at least, a train I do not control) heading toward a track switch. A hand is on the track switch, ready to send the train in one direction or another, but I don't know which, and I don't know what is down that track. I suppose all of life is actually like this, but being the (flawed, mortal) carrier of another life I always feel it more. 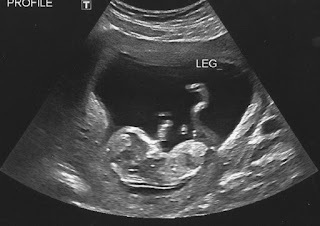 Sprite's 12-week ultrasound, including nuchal translucency scan and other screenings, felt very much like an upcoming track switch. Of course I knew what I hoped to see, what everyone else hoped to see, and indeed, was expecting to see: with more confidence than I felt, it often seemed. I thought about and read about all sorts of possibilities in the days leading up to it. I can't say I had any coherent thoughts about them. I just had to look....at different possibilities. But we got the best possible results last week. Remembering that AJ was rather unco-operative at her scan last time around, and wouldn't move for the technician, I ate a couple of candies shortly before the scan. Maybe it worked, because the first thing the technician said was "there is the baby moving around" (phew) and then told me to go pee, because despite never drinking as much as recommended I still managed to have too full a bladder. Sprite was very wiggly throughout the whole scan, which was lovely and fun to see. There was no trouble getting all the measurements, and they lined up with what they should be. "Everything that should be there, and nothing that shouldn't," as Mr. Turtle put it. He/she is slightly longer than expected for gestational age - a tall baby? Heart rate is identical to AJ's (Ember's) at the same age: 150. I may amuse myself by trying to read (contradictory) things into that information: but mainly I'm happy - VERY happy - that Sprite is developing normally as far as we can see and my odds for chromosomal conditions are revised to 1 in the thousands, with no further screening recommended. I'll take those odds. My due date was revised to January 31st. I am rather unreasonably annoyed by that; I preferred February 1st. It's just a day though. Afterwards, relieved and ravenous, Mr. Turtle and I went out for lunch and had a nice visit. I had decided that if all looked good at this scan, I was going to make a mental and emotional effort to Move On: and follow that up with actual actions, in so far as I am able. First step: "allow" myself to be happy. Start wearing maternity clothes. I actually washed them all the day before the ultrasound, but I didn't put them in my drawers: I left them in the laundry basket tucked away in a corner. I'm at a weird stage where regular size pants aren't comfortable, and tend to fall down, but maternity clothes don't quite fit right either (at least in the first part of the day). But the maternity clothes are still better overall, and unlike last time when I tried to stay in regular clothes with bella bands, and conceal what was going on, I'm all about comfort now. Referral to ob/gyn. I have the same ones as last time, which I'm happy about, and see them in the fall for the first time. I stay with my regular doctor till then. Again, I'm pretty matter of fact about it. It feels good to take this step. Contacted our doula from AJ's birth and made plans for her to attend the upcoming birth. I haven't discussed the "birth plan" in detail but assuming it will be the same as AJ's: hospital birth, as few interventions as possible but retaining all options, and Mr. Turtle and doula in attendance. I am really happy that I can have all the same pieces in place as for AJ's birth. I know I can't predict what will happen, but it is comforting to have familiar elements. I'm especially happy that we can have the same doula. Last year she moved out of the city with a new boyfriend, though she still returned for some births. However, the boyfriend is now a fiance and they are moving back to the city this fall. Another way in which "timing" has worked out just fine, despite having, like, no control over timing. Get my hair cut and highlighted for the first time in 4 months. I have been growing it longer, and then when I got pregnant and was sick all the time I didn't want to go to the hairstylist. But I have been feeling neglected. I had a new stylist this time, and I gave her my perspective that haircuts are temporary, I don't take myself too seriously, and I trust her to suggest what might look good. So I got a slight trim, not losing a lot of length but much weight, and some highlights that we tinted strawberry. The pinkish colour will fade in a few weeks but it's fun for now and I'm liking how it works with my skin. Manicure and pedicure, which I still haven't done. Embracing better daily energy and health. I still turn into a pumpkin around dinner time, but I can keep going quite well in the middle of the day for several hours, and I am even skipping my noon nausea pill. (I still carry it with me, in case things go south). Processing that this will most likely be my last pregnancy and child. I'm 95% sure it will be, assuming it ends in a live baby. If not, I might find the courage to try one more time, though I don't like to think of that. At all. I will be 38 in December and after 6 years of focusing significant time and effort on getting pregnant, I really think I'm done. Of course I have all these brain patterns specifically dedicated to TTC, and who knows what I will do with them all. I have to admit, that the thought "this is the last time I'm pregnant" has so far brought a feeling of relief. I want this pregnancy to work, because I want and love my unborn child. But also partly because I really don't want to do this again. The nausea was worse, the fatigue was worse; I'm older and busier with responsibilities. The screen didn't suggest chromosomal differences, but of course that's not a guarantee: I always have in the back of my mind I COULD have a special needs child (anybody can). I have faith that I'd face that reality with love and resolve, but I'm not anxious to take on further risks as we age. Still. I know my nausea and overall physical weakness is affecting my emotions at the moment, as as those symptoms (hopefully) lesson, I'll probably have more complicated feelings about this likely being the last time. I hope to embrace those feelings with the awe and gratitude that we are in the position to make this decision while getting what we wanted. It's a VERY different decision than the one we would face if the gamble did not pay off. And we were one little track switch away from that reality. But hey. In CS Lewis's Screw Tape Letters, the senior devil gives the junior devil this wise advice about humans: Do whatever you can to prevent your human charge from living in the present. It is better if he lives in the past, but better yet if he lives in the future. Because when they live in the present, humans are the closest they can get to heaven, if they only knew it. So, begone devils. Here is my present, my ever changing growing present. I give you: Sprite. I'm cautiously optimistic I'm on an upswing. I'm getting some pleasure out of mundane things; that's how I can tell. The nausea seems better overall. I'm scared to write that because several times it seemed better and came back in various shades of awful. I'm still actually quite terrified of it, and reluctant to voluntarily reduce my medication dosage. But I do feel better overall: I have a good appetite most of the time, and my "yucky" times are more predictable: they mostly happen in the evening now. In the past few days I was able to go on a day trip with AJ and Mr. Turtle to the mountains and take a short hike, which was awesome. AJ loved seeing all the flowers on the trail: she rushed from one to the other squealing: "More flowers! More! And more! Yellow flowers! Red flowers! White flowers! Squeeee, A BUG!" This is a parenting fantasy come true. I always wanted my child's formative experiences to be with nature. We spend so much time in the created world of humans, and the technological side of it is especially penetrative. But before AJ is too immersed in the created world, I want her to understand what it is created from and about. A flower is not just a picture or a symbol or a cartoon, it is a flower. She will have many mediated experiences of flowers, but nothing should replace her experience with a flower. Seeing her on this hike made me feel like I am succeeding here. I'm happy. I also found the energy to do some daytime activities. We spent an afternoon with my mom at a local park and outdoor swimming pool. We had a picnic. We splashed for hours. Life was good. I had lunch with a (very pregnant) friend I haven't seen in a while. I should be around 11 weeks now. My ultrasound (including nuchal translucency and other screening) is next Friday. No bleeding (but I check the toilet tissue every damn time; I always see blood in my mind.) I'm hoping this next ultrasound shows everything is just fine, and I'm hoping that it is a before/after milestone: Before, caution, hopefulness in check, fatigue, illness, disconnection; After: Feeling better, reassurance, more engagement with the world, more active planning for a baby. And family vacation. At the same time I know hope is just hope. I know our lives could take other twists and turns. But I hope. In the meantime I'm starting to act a bit more alive, and to take enjoyment out of small things, and it's kind of satisfying to deal with small annoying things vs. terrifying things that derail my life. Today's accomplishment so far: using up the balance (minus a few cents) on a pre-loaded credit card I've had for....two and a half years? and which is about to expire. This was not as easy as you might think and in conclusion I am not a fan of either preloaded cards or online shopping. I must be old. This card was electronic use only. So I had to think of stuff I could buy most easily online, which isn't as easy for me as it might be for some people. Then it took me a while to figure out I had to register the card online for it to work at all. OK. The first few purchases (movies) were easy. But then when the balance got lower I couldn't just buy whatever I wanted. First I forgot the balance on the card, and went online to check it. Apparently I can't answer my own security questions correctly (is the answer to "what model is your phone" "iPhone5" or "iPhone" or "IPHONE 5" or......). Account locked, customer service called. Once I dealt with that I went searching for items on Amazon that were within a certain price range. I can never think of what I need or want when my goal is specifically to SPEND MONEY. I found a CD that cost less than the balance. Good. Then I was down to just over 6 dollars, which is when it really got challenging. I filtered my search for items that were around two dollars. That should have made things easy, but nope. I don't know if it's just an Amazon.ca (Canadian) thing, but there are all sorts of items listed for a couple of dollars and cents, but when you go to order them, about ten dollars of postage is added on. Seriously, WTF? Who would buy pencils for $1.50 and then pay ten dollars postage? Why even show me that crap? Anyway, I finally ordered two sheets of stickers for AJ and reduced my balance to a few cents, which I don't care about. This is probably how the company makes money: if everyone leaves a few cents on their cards, they get to pocket it. Whatever. PSA: don't buy people preloaded cards. Give them money or a cheque FFS. Plus you don't pay tax on cash or a cheque. -I have pregnancy bloat that sort of looks like a bump. It's kind of amusing. I haven't brought out any maternity clothes (waiting on that ultrasound) but I put away a lot of clothes because I have no interest in wearing them. The less is touching my body, the happier I am, so I'm living in sundresses and linen smocks. I finally did take out my maternity bras because I could no longer pretend my regular bras fit. I'm not quite filling up the G cups but they fit much better than the other ones. It all suggests I'm probably still pregnant so not complaining. -Crazy vivid dreams. I think I had this during the pregnancy with AJ too. Sometimes they are disturbing, sometimes amusing, somethings just plain weird. -Unkempt hair, because I want to be feeling better when I get it cut and maybe highlighted. -No food aversions really, other than avocado. I just randomly like and hate things. I'm temperamental and kind of ridiculous. -Absent minded. If I don't literally say out loud "I'm now doing X. I have now done X" half the time I can't remember 5 minutes later if I did it. Carrying on. One day at a time, one small pleasure and errand at a time. I had some interesting topics in mind I was going to write about, but can't muster the energy or enthusiasm for them today. Which is often the story of my life. So I'll save the interesting stuff for later, and just write about how zapped I am today. At least I'll have a blog entry to show for it. I have good days. I was at a historical theme park most of the day Saturday with family and friends (I have a real life mom friend now, wow) celebrating Canada's 150th anniversary. I did really well. And then yesterday and today I could do almost nothing. Putting a load of laundry in or picking up AJ's toys was a major effort. For every chore I contemplated doing, I contemplated just giving up and going to bed. Going to bed won at least half the time. I am sure part of this is physical but part of it is psychological too. It's hard to get excited about life when I am focused on merely existing (eat, sleep, not get sick). And then there's also the underlying pregnancy anxiety. It's not overwhelming at the moment, but it's there. I'm not always scared but constantly managing it (and the tiredness and nausea) leaves me.....flat. I'm not really into anything. We also found out today that my sister in law (Mr. Turtle's brother's wife) is pregnant. She is due exactly a week after I am supposed to be. Hahahahahaha. I mean, this is good news. My BIL and SIL are lovely. Everybody wants them to have kids. I want them to have kids. They were married 4 years ago (3 years after us). I worried at first they would have kids before us, which I did resent, but they waited (voluntarily, as far as I can tell, and I have a good nose for these things). Even with all the fertility issues, we still had the first grandchild. And hey I'm pregnant again, against the odds, and currently no reason to believe it won't end well. I have to admit the situation is kind of cute. It's something for Mr. Turtle and his brother to bond over, and I'm sure they will. Still. Part of me wants a belly buddy and part of me shrinks from the idea. I felt the same way when I was pregnant the first time and so coincidentally were many other bloggers I followed. You hope everything goes well for everyone but there's also that feeling of dread for what it will be like if one of the pregnancies ends sadly while the rest go smoothly. Anyway. SIL is across the continent so it's not like this will in my face all the time, though it will be an important part of our lives. It's just rather ironic and it makes me both more aware of the shadows while pushing them away with whatever energy I have. The other thing I have to figure out is the best way to tell new mom friend I'm pregnant. She is older, needed fertility treatments to conceive her son, and had a loss last year at 19 weeks. I have to disclose at some point but I really want to do it in a way that is sensitive. We either text each other or see each other in person. I'm leaning towards texting but I'm traditional and cringe at disclosing something like that via text. I dunno. Maybe I'll try to think of an excuse to get her email. Email seems more dignified somehow. Maybe I'll figure it all out this week. Or maybe I'll just sleep a lot.